Joan's Gardens: NEW Creative Expressions by Sue Wilson 2015 Festive Collection!! NEW Creative Expressions by Sue Wilson 2015 Festive Collection!! Angel - approx. 5" x 4 3/4"
Joy - 1 3/4" x 1 3/8"
Largest star is 1" x 1 1/4"
Frame - 4-1/4" x 6-1/8"
Snowflake border embosses and cuts - 7" x 1 1/4"
The tag has snowflakes adorning each side with a center solid piece for adding a sentiments or name - 4" x 1 3/4"
Snowflake corner cut and embosses and there is even a design embossed on the edges of the corner - 2 1/4" x 2 1/4"
Snowflake sizes - 3 1/4", 2 1/2", 1 3/4", 1 1/2", 7/8", 5/8"
This wonderful set features snowflakes peeking inside the frame that are embossed and perforated as well as a text "Let it Snow" as a separate die that can be placed anywhere on your card. The snowflake frame cuts a design into your card but if you would like it to cut away from the paper you would use it with one of the oval dies that come with this die set. The oval dies can also be used for layering around the frame in different colour cardstock. Sizes - 4" x 3", 4 1/2" x 3 1/2", 5" x 4"
"Let it Snow" - 2 3/4" x 1 1/4"
This die is unique in that the embossed snowflake instead of popping out of the paper when embossed it leaves a depression into the paper. The dies are cutting and/or embossing/debossing dies that can be used individually or together depending on whether you want to cut the shape out of your paper or not. It comes with a debossed die that does not cut, a shape die that cuts around the debossed die, an oval die that cuts a design into your paper and an oval die that cuts a solid piece that can also be used to cut out the center oval. Sizes from outermost die to center die - 4 1/2" x 3 1/2", 4" x 3 1/8", 2 3/4" x 1 5/8", 2 1/2" x 1 3/8". This die set has been designed in several sections so that it is truly versatile to use! It makes a beautiful Christmas scene when used all together, complete with a tiny Santa and sleigh flying across the moon. Sizes Approx: Large Frame outside edge = 4" x 5 1/8" with a opening of 3" x 4 3/4" the next 2 frames are 1/8" smaller of each other and the center circles are 1 7/8" and 1 3/4"round. Dove - 3 1/4" x 2"
"Peace" text - 2" x 5/8"
striplet - 1 1/2" x 5"
rectangle die - 1 3/4" x 5 1/4"
striplet - 1 5/8" x 5"
rectangle die - 1 3/4" x 5"
This set includes 5 sizes of poinsettia and 3 sizes of leaves. The die cuts the petals and the overlay outline of the flower and leaf that way when you cut the dies with 2 coordinating colors of cardstock you can place the petals behind the outline. It not only adds a beautiful detail to the top of the flower, but looks amazing when used by itself for a more filigree look. I know that you will enjoy adding it to all your seasonal cards! 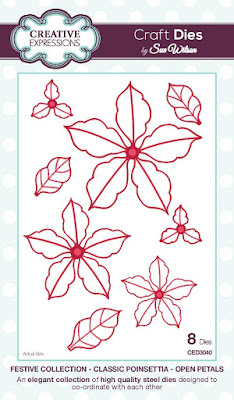 Sizes: Largest poinsettia - 3 1/4" x 3 1/4"
Largest leaf - 1 1/2" x 5/8"
largest 3 1/2" x 2" - smallest 1 1/2" x 3/4"